While having lunch recently with my friend Wendy, she was telling me about a recipe she had been working on for the Secret Recipe Club. The Secret Recipe Club?? I had to know more! I have my hands in quite a few food-related projects these days, but that didn’t matter I immediately knew I wanted in. The Secret Recipe Club is a group of food bloggers who each month are assigned another person’s blog from the club but hush, mum’s the word on who you got… It is a “secret” recipe club after all. Next, we visit the blog to check out all their goodies and choose a recipe to make from their site. We can adapt it however we like and then write a post on it. We all post on the same day and get to see who got who. Sounded like fun to me! For my first assignment, I was given the blog Fried Ice and Donut Holes. The author of this blog, Melissa is a teacher by profession but loves to bake and cook, all the while sharing that passion with all of us through her blog. 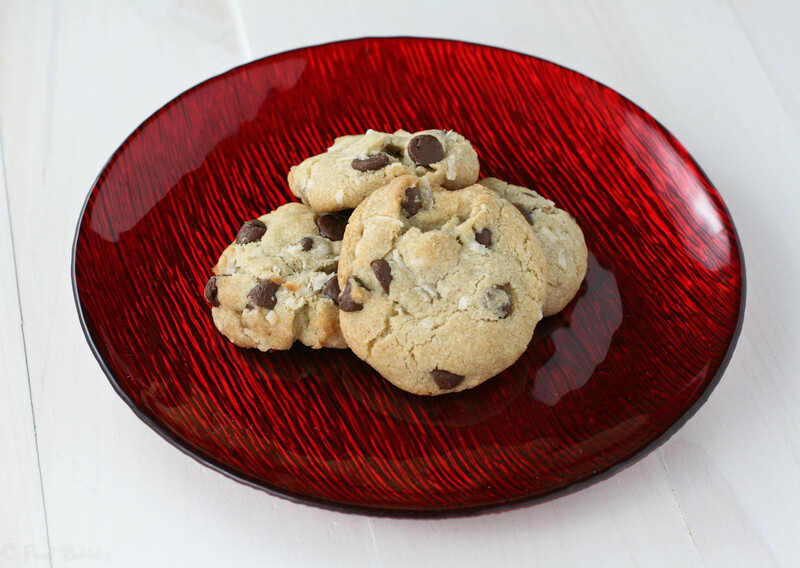 After cruising around Melissa’s site for a bit I came upon a recipe for salted chocolate chip cookies. I’ve always been a fan of the whole salty/sweet combo so once I laid eyes on that recipe, I knew that was the route I wanted to go. Recently I’ve been reading a lot of baking recipes that contain brown butter in the ingredient list. I love the flavor of brown butter in the savory dishes I cook. It just seems to add a level of complexity to the flavor profile of just about anything. I love how the butter takes on this nutty aromatic smell as it browns. So for my version of these cookies, I made mine with brown butter. I also added some shredded coconut cause I happened to have a bag sitting right at eye level as I was making the cookies and said “Sure! Why not?” and so in that went. These cookies get finished off with a little pinch of sea salt that just takes them from yummy to over the top delicious. The recipe made a lot of cookies… about 4 dozen or so. So if you’re not looking to feed an army you may want to cut the recipe in half. Fortunately, I happen to make these on the day before Mike was off to the firehouse. The next morning I sent him into work with several dozen cookies. Those cookies didn’t stand a chance! At lunch time he sent me a picture of the tray he took in… there were only 4 cookies left! Needless, to say the guys at the firehouse devoured them and they were a big hit. These are definitely a new favorite in our household as well. – Place the 4 sticks of butter into a medium saucepan over medium heat. Melt, swirling gently. Once the butter has melted, it will start to boil and foam. Stir every now and then. Watch the butter carefully. (It can quickly go from brown butter to burned butter) The color will begin to change and little brown bits will form around the sides and on the bottom of the pan. Once the butter has turned a golden brown, remove from heat and transfer to a bowl to cool. – In a medium bowl, mix both sugars, the cooled brown butter, eggs, and vanilla. – In a large bowl, mix the flour, salt and baking soda. – Add the wet ingredients into the dry ingredients and combine until moistened. – Fold in the chocolate chips and shredded coconut. – Scoop the dough onto the prepared baking sheet by rounded teaspoons. Sprinkle tops with just a pinch of fine sea salt and bake 9-11 minutes. Allow to cool 5 minutes on the baking sheet and then transfer to a cooling rack. PS… Don’t forget to go check out what the other members of the Secret Recipe Club were up to this month! OH these look magnificent. I can’t wait to try them. Thanks Savannah! Hope you enjoy them. Hi! I just found you through the secret recipe club. Love your blog! I’m a new follower. Those cookies look delicious. The combination of salt & sweet do really enhance flavours to a different level. Thanks and I couldn’t agree more, Rituparna! I love sweet/salty combos. So delicious! I recently made some chocolate chip cookies with browned butter and molasses and I think I finally found my true cookie nirvana so I can only imagine how good these cookies are Kate and wish I had a little (or big) plate of them with my coffee right here, right now! Thanks, Barb!! Yes, I remember seeing those chocolate chip cookies with browned butter and molasses. They sounded so good! This was my first time using browned butter in a baked good. I loved the flavor so I’ll definitely be doing it again. They look amazing I am so making this recipe. Thanks Sara!! Hope you enjoy them if you make them. Hi Amy! Thanks for the compliment. I am headed over to your blog right this very second to see what you chose to make. Can’t wait to check it out!! Welcome to the club and your cookies look wonderful, love the flavor combo. 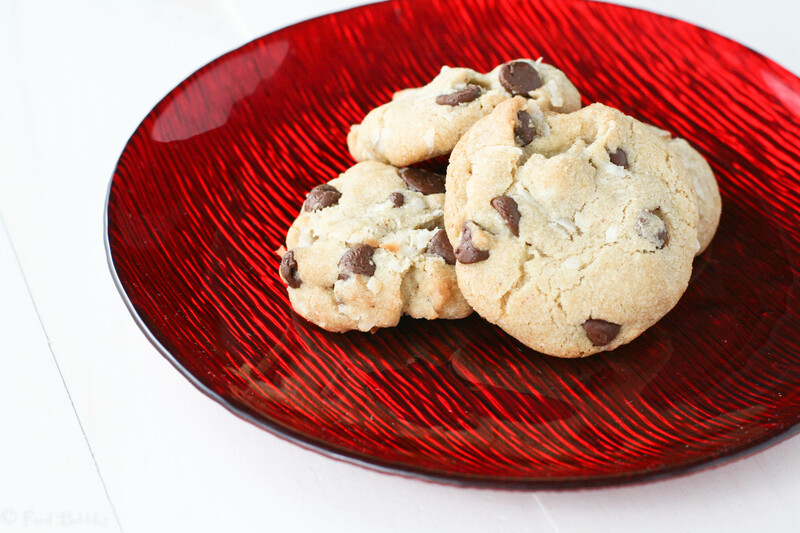 If you haven’t already, I’d love for you to check out my Group ‘A’ & ‘C’ SRC recipes this month: Levain Bakery Chocolate Chip Walnut Cookies and Thin Mint Irish Coffee. Thanks for the welcome, Lisa! I will definitely go give your recipes a gander 😉 I’m sure they’re spectacular! Hi, First timer for the SRC too. We love chocolate chip cookies in my house and adding browned butter sounds delicious, so I’m looking forward to trying these. Hi April! Welcome to SRC. I’m really looking forward to being a part of it. Glad you liked my spin on this recipe. These sound really yummy! I love cookies wih brown butter but I’ve never had them with coconut! Thanks Kirstin! You could certainly omit the added salt on top and I assure you, they will still be delicious! Hope you found your blog 🙂 If not, they’ll soon send out a “who had my blog” email list. these sound so good. I love sweet things that have a bit of salt in there too! mm they look super soft! Great Recipe for Group D’s Reveal Day for Secret Recipe Club! I just checked out the SRC page and saw you had my blog. I’m so glad you liked these cookies. Your addition of the brown butter and coconut really sounds delicious. I may just have to re-make these cookies your way! Welcome to the SRC! The cookies would be right up my alley too and I love the addition of coconut! Brown butter, salt, and chocolate! This recipe is screaming my name. I’ll have to give this one a shot. Thanks for the inspiration! I always love a new take on chocolate chip cookies. Hello fellow SRC member these look great! Hello there! Thanks for passing by and thanks for the comment! These cookies look and sound amazing! I love the idea of adding coocnut to the cookie!! Yum! Mmm, I love salty chocolate things and the added coconut sounds great in these! Thanks Katrina! These cookies were dangerously delicious!